Leah is our little free bird. She doesn’t make a lot of sense, but she doesn’t have to. The more random she is, the more joy she seems to bring. So when it comes to her birthdays, nothing she suggests is a surprise. She usually sticks to the pretty standard princess type themes. But when I inquire about what kind of birthday cake she wants, that is where it goes off of the beaten path. Last birthday she asked for a flamingo. Now, a unicorn wouldn’t be so “out there” for some kids. But I’ve never heard Leah even mention one before (anymore than she’d been into flamingos the previous year). Isaiah and I discussed whether I could pull it off or not. He said, “Well, if you can do a flamingo, I think you can do a unicorn.” Which made sense. See, I’m not a cake decorator. At all. In fact, I’ve had some cake disasters. See here. And here. But I can draw ok. So I just thought of it as drawing in frosting. I wonder what she’ll ask for next year. Leah turned 4. Not quite sure how that happened, but in honor of the blessed event, we’re having a Princess Party. With a princess cake. 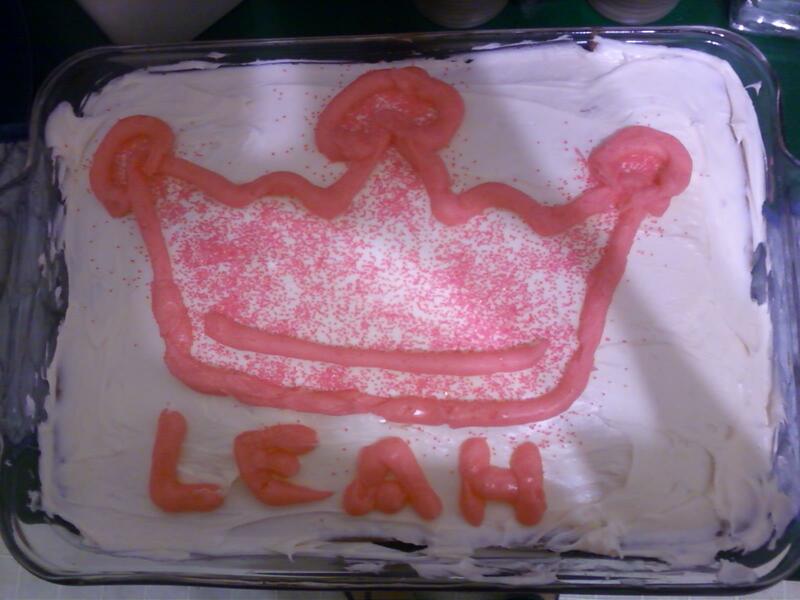 I’m no cake decorator, but I offered a cake with a princess crown on it. How hard could it be? I got a nice squeeze tube of pink frosting to do the trick. 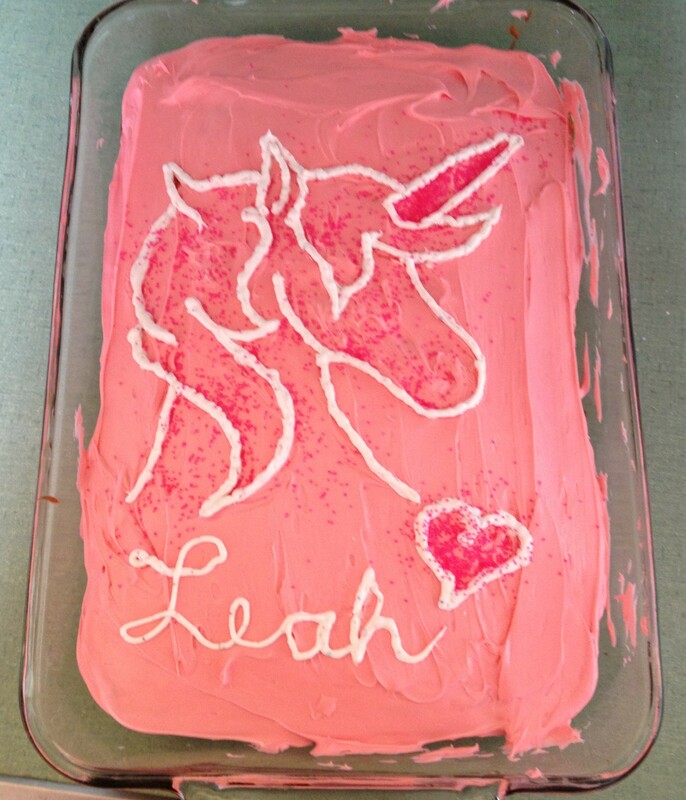 I did not read the back of that pink frosting. 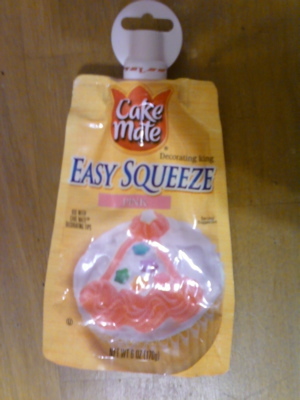 Did you know that when you buy Cake Mate Easy Squeeze frosting, that you also have to buy (or have on hand) Cake Mate decorating tips… to attach to the frosting? I didn’t. And I’m pretty good at making things work. This isn’t the first time I haven’t read the packaging. I’m almost a professional wing-it girl! It might not have been quite the look I was going for. But I think Leah will be happy. Especially because my way means double the frosting in each bite! So yesterday was my birthday! Except, around our house, birthdays last about a week. On Sunday Chris took me to Chili’s. We love Chili’s, but we have to drive 30 minutes to get there, so it’s not usually a spur of the moment thing. Chris told the waitress that we were celebrating my birthday, so a bunch of staff came out and sang to me. And they brought me the token sundae. Did you know they charge you for that sundae? I thought that was kind of funny! When I came home from doing my grocery shopping this week, something smelled really good. I asked Chris what smelled so good and he said, “I don’t know. There is a candle burning.” Five minutes later, he pulled a cake out of the oven… sneaky! Isn’t that the sweetest thing? My husband made me a cake! I got my actual birthday present a couple weeks ago. Chris got me a digital camera. I don’t know what kind it is, except that it is a Sony, it is small and sleek, and it takes good pictures! So I’ve been having a lot of fun with that! Then, yesterday, Chris gave me a bunch of dangly earrings, even though the camera was supposed to be my whole present. My husband is never satisfied unless he is spoiling me :). I’ve concluded that there are few things in the world that make me happier than dangly earrings! We went to our favorite taqueria for dinner. So I didn’t have to cook, and they have the best chips there! This made me very happy! In non-birthday news, Isaiah is doing great without his pacifiers. The first day, he never did get a nap in. He was just too upset. But by the time he went to bed, he had enough time to think it all through and he didn’t even ask for his nu-nu. He hasn’t asked for it since, so I think he’s going to be just fine! Last night, Isaiah put his first mural in our home. Somehow he had gotten some crayons smuggled into his room. We put him to bed, not realizing this. So when I went to re-tuck him in, I found red crayon ALL over his wall! He was trying to show me where he had drawn a tree, but I was having a hard time getting excited about his artistic masterpiece!